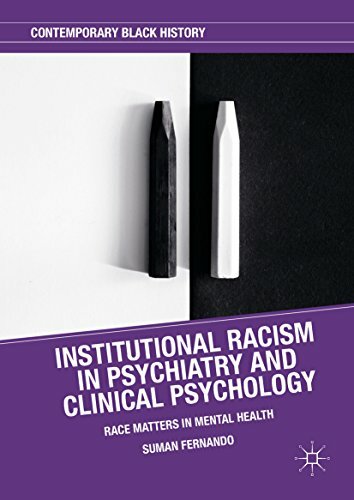 The current review of the Mental Health Act (see previous post) needs to take account of the recently published book Institutional racism in psychiatry and clinical psychology: Race matters in mental health by Suman Fernando. Part of the concern leading to the review is that "People from black and minority ethnic populations are disproportionately affected [by the Mental Health Act], with black people in particular being almost 4 times more likely than white people to be detained" (see news story). The purpose of the review is to understand the cause of this and other issues (see terms of reference). I think it is also important that the government deals with the issue of racism in society in general and not does not deflect it just onto mental health. The marginality and social exclusion experienced by minority ethnic groups are likely to be significant factors in this imbalance. Black compared to white patients are diagnosed more frequently as schizophrenic by both black and white clinicians - although to a lesser extent by the former - even when clear-cut diagnostic criteria are presented (Loring & Powell, 1988). African American men receive higher doses of antipsychotic medication than white and are more likely to be described as hostile and violent (Metzl, 2010). It's difficult to think the stereotype of "Big, black and dangerous" is not a factor in disproportionate detention under the Mental Health Act (see blog by Nuwan Dissanayaka). Racism within psychiatry needs to be addressed (Sashidharan, 2001). There is of course a history of attempting to deal with these problems, which the current review cannot ignore, particularly the report Inside Outside. People who use mental health services should expect services to be non-discriminatory. What we need is a national approach aimed at reducing and eliminating ethnic inequalities in mental health service user experience and outcome, and this includes treatment under the Mental Health Act.